. Published on Thursday, March 22, 2018 . Photo of former and current ASI Campus Recreation students and professional staff gathered at their alumni event. 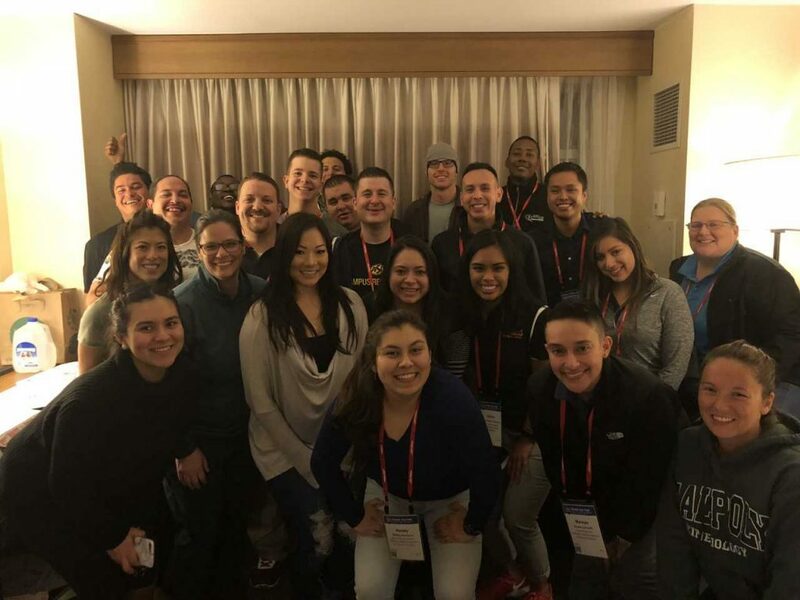 Five student employees and six professional staff members of ASI Campus Recreation had the opportunity to travel to Denver, Colorado on March 4-7 for the National Intramural-Recreational Sports Association (NIRSA) conference. The purpose of NIRSA is to highlight and regulate collegiate recreation organizations across the nation. The national conference takes place in a different city across the nation each year, and members are invited to attend workshops, seminars and network with campus recreation employees from various universities in the U.S.
ASI Campus Rec has sent representatives to the NIRSA conference for over 15 years, long before the Bronco Recreational and Intramural Complex (BRIC, Bldg. 42) was constructed. Workshops and seminars offered at the conference included varying topics that ranged from sustainability, marketing, inclusion and management. Shelbi Long, associate director of Campus Recreation attended many workshops at the conference and highlighted an inclusion workshop as one of her favorites of the week. This workshop by Sacramento State focused on the importance of offering programs for students of all abilities, and how other recreation departments can build upon the inclusive environment they create for students. A unique addition to this year’s conference was an informal Cal Poly Pomona (CPP) alumni event that our attendees coordinated. In addition to our 11 CPP representatives, 12 alumni who are now in graduate or professional positions at universities including Ohio University, University of Houston and Cal State Monterey Bay connected for a night of reminiscing on their time at CPP and discussed how much the Campus Rec department has grown over the years. Featured in photo from left to right: Kaycee Tanioka, Intramural Sports (IM Sports) and Sport Clubs coordinator; Raamen Bass, former ASI IM Sports coordinator; Shelbi Long, associate director of Campus Recreation; and Andy Ramirez, former ASI IM Sports coordinator. One of the most powerful factors of the conference is the like-mindedness of all the attendees. “Being able to explore a different state and get together with individuals that have the same values and motivation as you is something that I will always be thankful for,” Arellano Rodriguez concluded. The five current students who attended the conference received funding through ASI‘s Emerging Leader program. This program was created to provide opportunities for ASI Campus Rec students to develop their leadership skills and skill sets. Beginning next year, this program will expand and include all ASI student employees. ASI Campus Recreation’s affiliation with NIRSA is long-standing, and the department leaders plan on sending representatives to the conference for many years to come. To stay in the loop with all Campus Recreation events and news, be sure to follow Campus Rec on Facebook, Twitter and Instagram!